Technically, it is not winter. Of course, the cold and snow over much of the United States would have many of us disagreeing with my first statement. It seems only fitting that today’s Tuesday Tales be about a winter theme book. As a teacher, I love to gift books to children. Much to my delight, JSL received a wonderful new book from his speech therapist for Chanukah last week. I have seen some of the other Bugs books before, but this one was new to us. Let me begin by saying that I love books that are unique and different. Anything that captures the interest of children is great. Then add in a twist, and you have the series of Bugs books by David A. Carter. To say that Carter take pop-up books to a new level would be a HUGE understatement. This next installment of the wildly popular Bugs series captures what everyone loves about chilly weather! From snowflakes and ski lifts to hot chocolate and snow angels, this new title is a perfect way to stay warm during the cold days of winter! 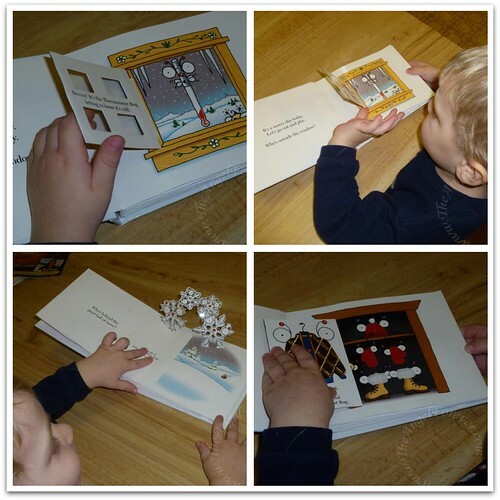 Paper-over-board book has cardstock pages with pop-ups on each spread. David A Carter is a master paper engineer who created the Bugs series which has sold over 6 million copies for Little Simon . He is the author and illustrator of the critically acclaimed color series featuring One Red Dot, Blue 2, 600 Black Spots, Yellow Square, and White Noise. He lives in Auburn, California, with his wife and two daughters. 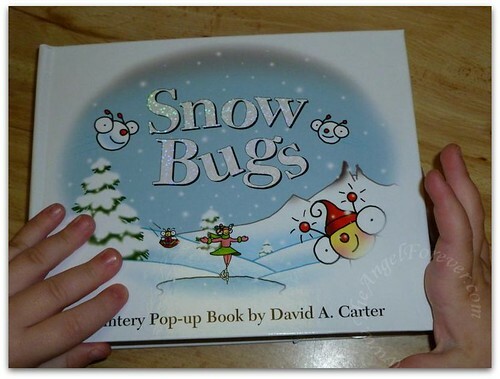 Some additional books in the Bugs series include: The 12 Bugs of Christmas, Jingle Bugs, Beach Bugs, Halloween Bugs, School Bugs, Birthday Bugs, Bed Bugs, Bedtime Bugs, and more. Right after JSL opened up his package and revealed a “buggy” book (his words), he wanted to check it out. We were at Nana and Papa’s house, so he ran into the kitchen to sit at the table. He saw the pop-up items and wanted to sit where he could open the book better and check out all of the features. After a little while of “reading” it on his own, JSL asked me to read the book to him. As I read, JSL took care of lifting flaps, turning items, or other surprises that were waiting inside. He loved checking each page to see what would happen next. There was no doubt in my mind that my three year old was actively engaged in the reading. When we finished the story, I read it at least two more times before we had to pick up big brother. I like the repetitive nature that allows younger children to predict what they may find under items to explore within the book. The illustrations and paper art within are absolutely beautiful and amazing. My only caution is that this book should be looked at while supervised with younger children. We learned the hard way that a 3 and 7 year old can do damage to the delicate pages without meaning to. Oy! So many extended craft projects could be done using this book. Children could create their own snow bugs, snow flakes, and more. I will definitely be using this book as inspiration for some projects over winter break. I would highly recommend this book for kids to read during the winter months ahead. I know that JSL has already asked me to check out more “buggy” books since he enjoyed this one so much. Disclosure: As mentioned, JSL received this book as a gift. The opinions expressed in the review are my own and were in no way influenced by anything. The widget within the review is an Amazon Affiliate where I will receive a percentage of money for the sale of the books should you opt to buy the book mentioned. I LOVE pop up books, but I have a hard time sharing them with the kids. I have a couple of pop ups by Robert Sabuda that are works of art in themselves. Right now, I’m reading The Phantom Tollbooth for a book club meeting this week. My son chose it, even though he has read it many times, because he loves it so much. But, I had never read it before.